Southern Accents has a very talented, creative team who are always ready for a challenge! 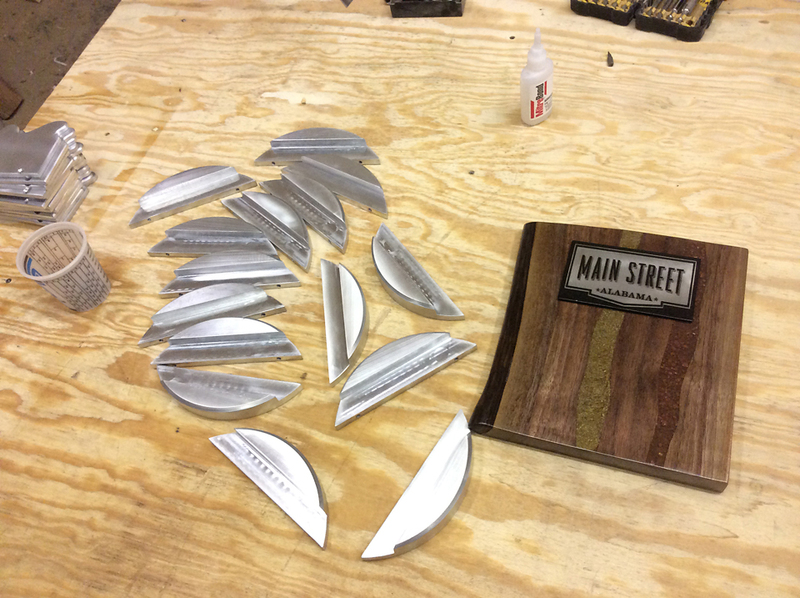 A couple of months ago we were approached by Main Street Alabama and asked to design, and then create, an “award” for their upcoming Awards Of Excellence Conference. 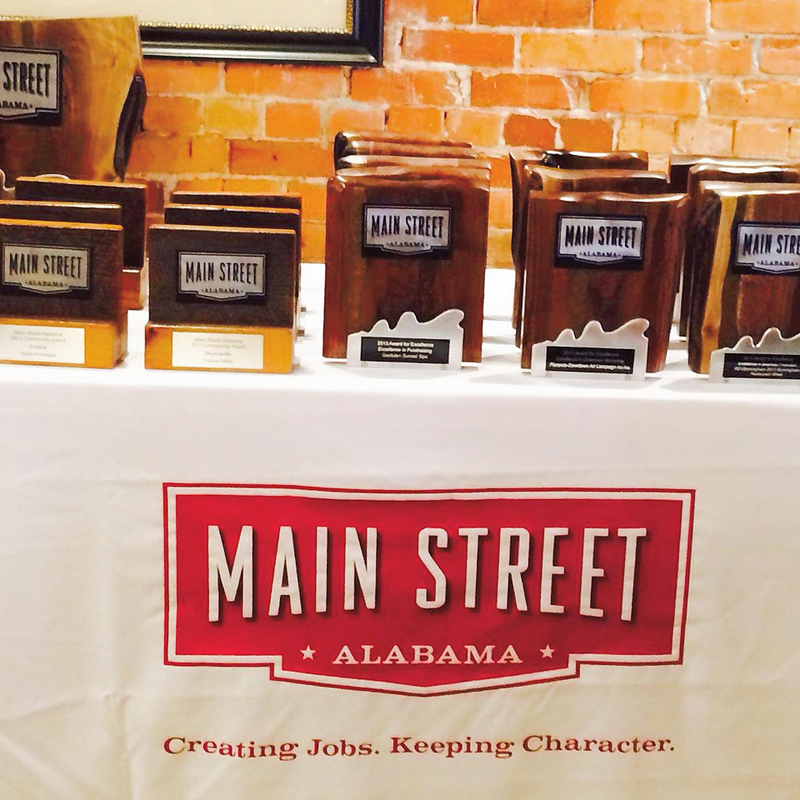 Main Street Alabama is an organization focused on bringing jobs, dollars and people back to Alabama’s historic communities by revitalizing downtowns and neighborhoods from Dothan to Florence. 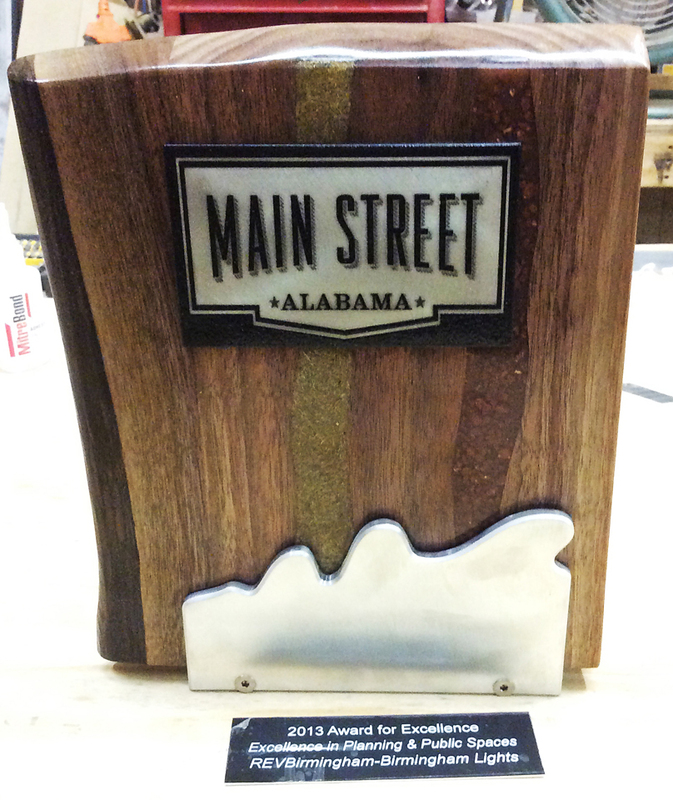 Main Street Alabama requested that the award be made of salvaged materials. We decided that we wanted to come up with something very unique using mixed medias. Our creative juices started flowing and pencils began sketching as ideas flowed at one of our weekly team meetings. 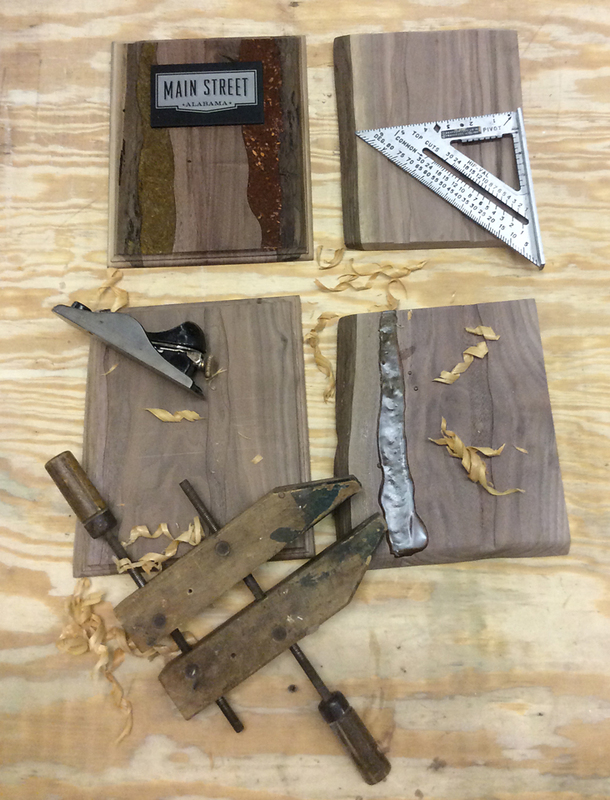 As Josh and Roger began work on prototypes in the wood shop, little by little the creative ideas began taking shape. Finally a finished product was built and the result was nothing short of stunning! Salvaged black walnut was used for the back of the award. The live edge of the wood and natural curves of the grain dictated the shape of each individual award. 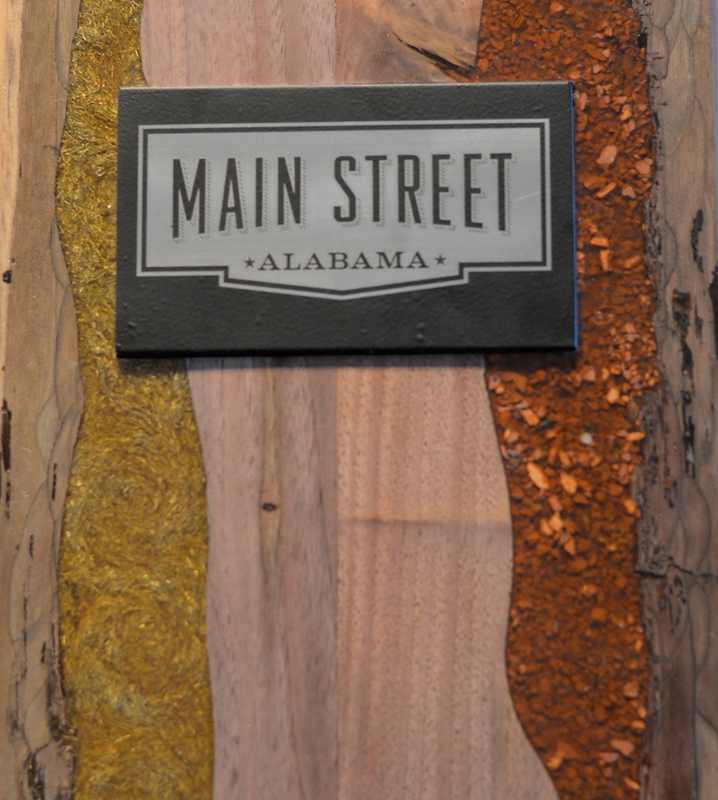 To add interest, and incorporate commonly found materials you would see in a street scape, Southern Accents obtained salvaged brass shavings and crushed red brick which were inlayed into the front of the award and covered with clear resin. We then had aluminum bases designed in an abstract shape as a stand for the award which added further interest to the overall design. The metal bases were built by Fuller Precision Machining. Plates were then engraved and attached to each award. Creating the awards were very time intensive but they were finished and hand delivered in time for the August 26th ceremony. The end result was even more spectacular than we had hoped! Our mission is to rescue, restore and protect architectural elements of historical significance. Opportunities that allow us to use our creativity to come up with ways to repurpose some of the salvaged goods that we rescue is a bonus! Our team of talented artists and wood workers are always up for a challenge. Stop by our showroom or give us a call at 877 737-0554 and let us help you with your next project. The making of an award! A topic of conversation at this week’s team meeting was how each of us have become more observant and more appreciative of antiques and architectural elements since we have been working at Southern Accents. We discussed how we now notice structures that never caught our attention before. We laughed about how, when traveling out of town, we feel this strange urge to stop at every little antique store along the way, even if only for a moment, to browse their collections. Being a part of the SA team has given each of us a new appreciation for things of the past. Working here has taught us how to recognize the art and beauty of hand craftsmanship and how to value the historical aspect of these items. 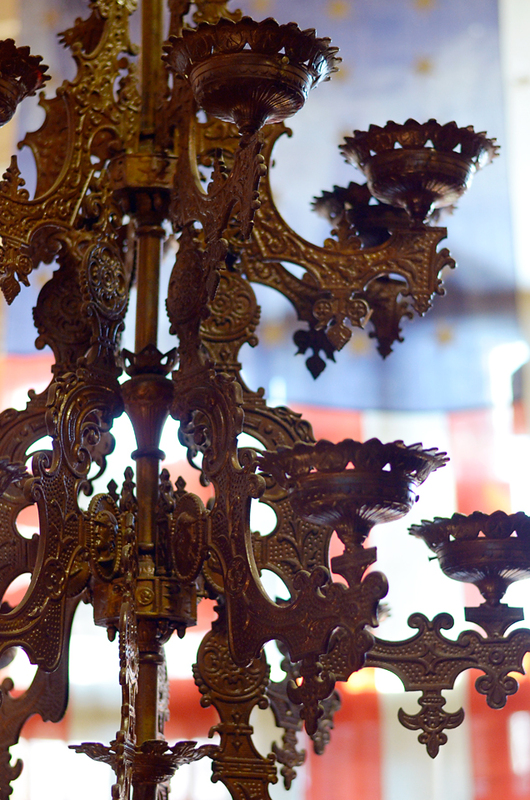 It has also helped to define our idea of beauty and has made us more aware of the need for preservation. This 3-tier iron chandelier, hung over the staircase in front of our huge American flag, has been one of the most photographed pieces in our showroom! This new found awareness is one of the reasons we often become attached to specific items that we bring to our showroom. Certain pieces breed a sense of comfort and familiarity as they evoke fond memories of simpler times. When these pieces sell, there is a sadness that comes with seeing them leave coupled with the delight of knowing they are going to a good home. 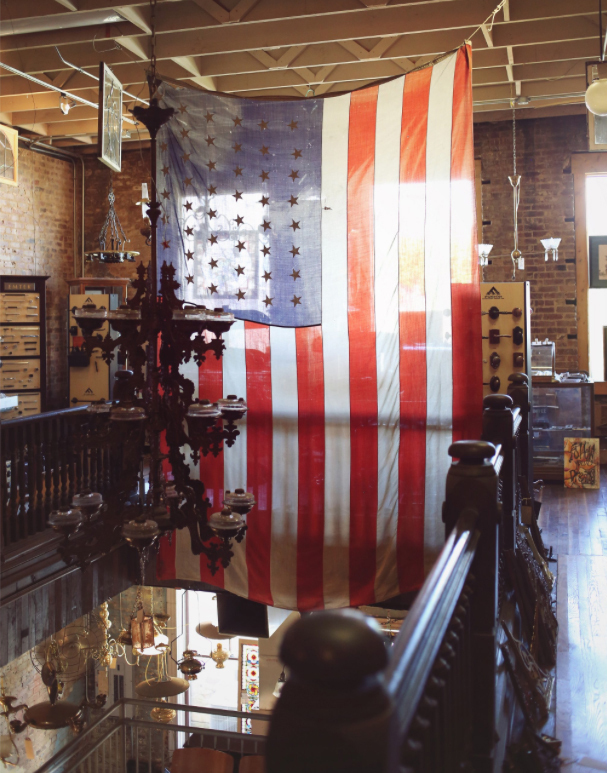 Two favorites currently residing in our showroom are the huge American flag that hangs above the staircase and the magnificent three tier cast iron chandelier that hangs in front of it. 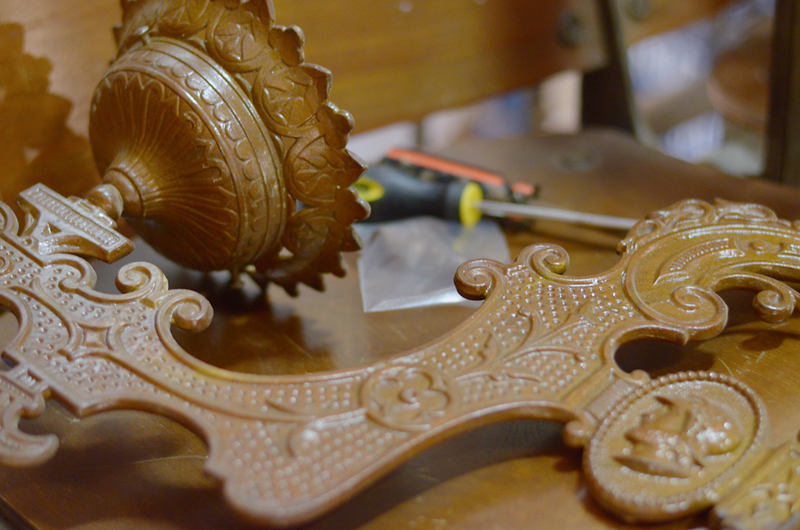 This week we began dismantling the chandelier, preparing it for delivery to it’s new home. The light as it was disassembled one arm at a time. The chandelier has been a mainstay at Southern Accents for a number of years and is one of the most photographed items in our showroom. Measuring 40″ wide by 80″ tall, this light is a beast! 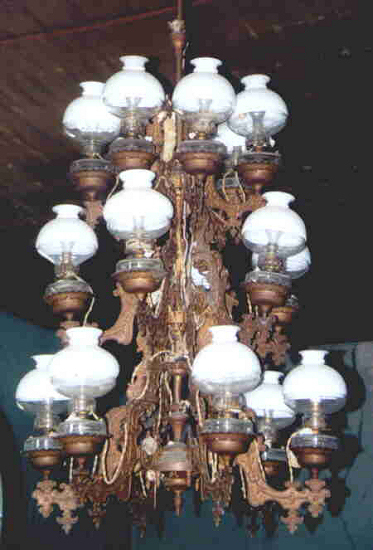 Originally a kerosene chandelier, it spent the bulk of it’s life hanging in a church built around 1887 in Shelbyville, Tennessee. The light was converted from kerosene to electric in 1963. After arriving at our showroom, the original glass globes were removed, carefully wrapped, and stored to protect them. Yesterday, the globes were retrieved, the original canisters removed, and preparations began to crate the body. Each piece of the light was carefully wrapped and boxed. 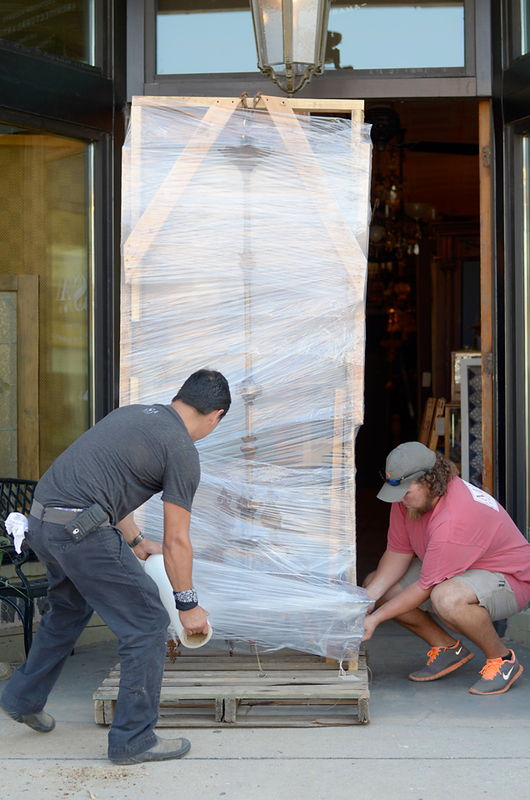 The large base was securely crated, wrapped, loaded, and delivered to it’s new home! Next week the walk up the stairs to our team meeting will seem a little ‘off’. The absence of this beautiful piece will be noticeable. We will however wait in anticipation of what will take it’s place, because for every “favorite” that passes through our showroom, we know there is another one to follow! Globes and canisters removed, this is the last picture taken of the light fixture before it was removed and crated for shipping. We’re always on the ‘hunt’ for that next awesome piece! 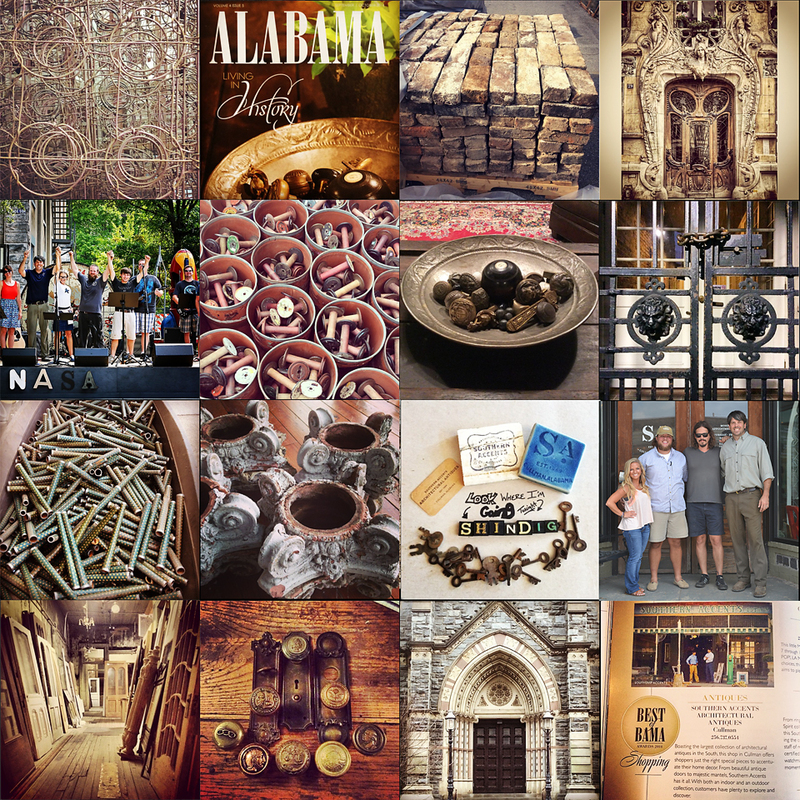 Whether we’re junking on the weekends or simply stumble across a fantastic find, you can share in the excitement by following us on all our excursions through our various social media accounts! They are all listed to the right! This archived photo shows the light with the original globes attached.